NASA's Hubble Space Telescope has just found the most distant lensing galaxy (which are massive enough to act as their own intergalactic microscopes) ever. And thanks to a rare alignment, it might just give us a peak at how our very own galaxy formed all those billions of years ago. When you look more than 9 billion years ago in the early universe, you don't expect to find this type of galaxy lensing at all. It's very difficult to see an alignment between two galaxies in the early universe. Imagine holding a magnifying glass close to you and then moving it much farther away. When you look through a magnifying glass held at arm's length, the chances that you will see an enlarged object are high. But if you move the magnifying glass across the room, your chances of seeing the magnifying glass nearly perfectly aligned with another object beyond it diminishes. Because we've stumbled upon this chance alignment, though, we're able to use the lensing galaxies distorting effects to determine its total mass (including dark matter) by "gauging the intensity of its lensing effects on the background galaxy's light." 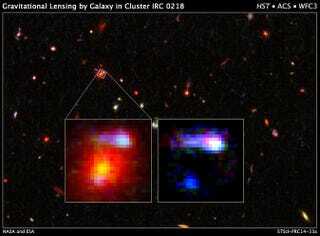 So how much does a record-breaking lensing galaxy weigh? Over 180 billion times more than our sun.